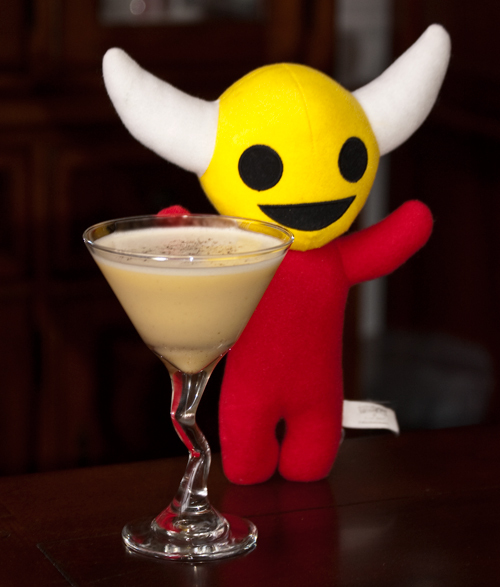 I was going to stop at three food-based cocktails for my Parade series, but then “deviled eggs” was mentioned to me as a joke (I’m not sure why I didn’t think of it since it is one of my lines; maybe something in my subconscious was trying to protect me). I’ve never made a full egg drink before, always staying with just the whites, so thought it might be fun to give it a go. Shake without ice then shake with ice. Double strain into cocktail glass. I don’t make many drinks with lots of ingredients, sticking mostly to a 3-4 + bitters sort of model, but I felt this one called for it. I wanted smokiness and spice, so I used a mezcal and tequila base with the serrano balsamic and chipotle bitters for some bite. For sweetness, other than the balsamic, I turned to Benedictine and a bit of a sweet onion sugar (in the past I tried to use this in a cocktail that turned out to taste like an everything bagel…), and in keeping the vegetable direction I added the caramelized ramp bitters. The lemon juice added some needed acidity and with the paprika seemed to work with the deviled egg theme. The final result with the egg was tasty but I didn’t think pushed things enough where they needed to go. Enter the Dijon mustard, which I think gave it just the right bite. I can’t believe I made a deviled eggs cocktail. You lost me at mustard, brother. That’s all right. I can mix you one without. But you’d be surprised, Scot!